Corsair has introduced two new models of its compact gaming PC, the Corsair One, equipped with Coffee Lake processors. Named the Corsair Pro Plus and Elite, each has been upgraded with Intel Core i7-8700K processors, replacing the Intel Core i7-7700K CPUs that last year’s models were equipped with at launch. Of course, with Coffee Lake CPU upgrade comes a new Z370 chipset and motherboard. To further sweeten the pot, Corsair has also added faster Vengeance LPX DDR4-2,666MHz RAM, topping the DDR4-2,400MHz memory found in older models. 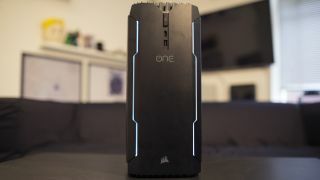 Other than that, the Corsair One’s other specifications remain the same. Both systems come with a liquid-cooled Nvidia GTX 1080 Ti as well as a water block for the CPU itself, 480GB of NVMe SSD storage and an additional 2TB HDD. The Pro Plus and Elite models of the Corsair One only differ in the amount of memory they’re each equipped with: 16GB and 32GB, respectively. The updated Corsair One models are available to purchase now with the Elite retailing for $2,999 or £2,999 (about AU$3790) and the Pro Plus for $2,799 or £2,799 (about AU$3,540).